The maiden edition of the Festac Food Fair was a huge success, The Festac Food Fair which is an initiative of FestacOnline.com.ng, a community based platform which is set to bring positive change to the Amuwo Odofin community and country at large. The food and sales exhibition, the first of its kind which took place in the heart of Festac Town, Lagos brought together Food and Drink Vendors as well as residents and visitors. It was sure an amazing event as participants testified to having fun as well good food. It created an avenue and opportunity to network in the community. This is the first ever community-driven Food Fair which aimed at creating awareness of businesses in the community. The Festac Food Fair 2016 was graced and well attended. Up to 13 vendors were present to showcase as well as sell and exhibit their products and services. Their offerings cut across everything from the Traditional Food to local; barbeque to smoothies, Cakes to ice cream and not Drinks as well as water. Exhibitors included vendors such as Aquadana , Winnys Meals, Belguim , Sweet Havens Cakes, Buddiechillz, Wilson Lemonade , Alma Foods, Thrizzles, Decafe, Magna Wine, Pancake Hub, Dominos, Cafe De Viande and Lasena. There were various media platforms to cover the event such as Lagospedia, Inside Mainland, Redcarpetontv, Shakaraaquare, Tsoule, Evateseblog, Deedees Blog, W2 Magazine, Gidiparrot, Gidiinfo and many others. 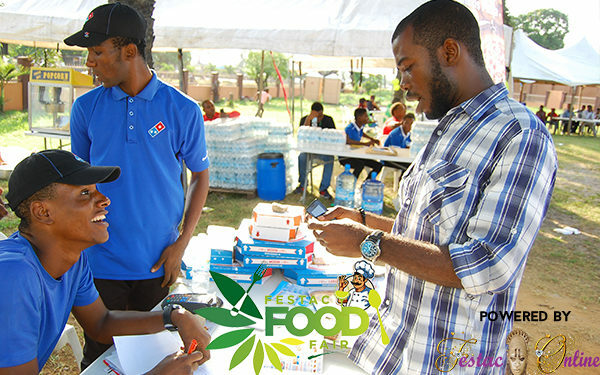 Keeping to their promise, the Festac Food Fair provided Free Wi-Fi which was proudly sponsored by Smile communications. It created an opportunity for families to stop by and spend Sunday together. Thrilling the attendees was MC Pampers, R4C, VJ Priceless etc. There were also different performances from various artist such as Teekay , Emdee, SKD , etc. During The Food event, 2 vendors grabbed the Vendor awards for different Categories. Thrizzles got the best overall Vendor award and Sweet Haven cakes got the award for Most-Friendly Vendor. The fair served as a perfect hangout spot for friends and family. Speaking of friends and family I got to meet a couple of really close friends at the fair. A couple of celebrities and personalities came through for the event which held at the 206 Park. The Raffle Draw was also another catch as there were up to 4 winners who got themselves gifts. Competition such as Drinking Competition and Eating Competition also thrilled the crowd as winners also got surprise gift packages. The Food fair which took place on the 27th November 2016 also shed more light on the good side of the Amuwo Odofin Community. Can these be held more than once a year? How often would it be held? Some Vendors asked. The event is a collaboration between FestacOnline the vendors and sponsors. The event this year was supported by Evabookshop and sundries, Smile, Wecyclers, Bodyline Gym, Evatese Blog, Media Guide, Hellomedia, Shakarasquare, Vconnect, Uber, Funbooth, Expoze PR, Olorisupergal, Saturday Chronicles, Supermart, BSDA ,Festival Mall, Gidiinfo ,Ynaija etc. FESTAC FOOD FAIR is the foremost community-driven outdoor food event which show cases the diversity in fine dining and food retailing both in the community as well as environs. See you next year at the Festac Food Fair 2017.